The federal province of Salzburg is wonderfully diverse - proper hight mountains in the South and smooth hills with lakes in the North (where I come from). For sightseeing, most people stay in the North, for the obvious attractions of Salzburg (city) and Hallein. Those who make it to the South usually do that to go hiking or skiing and care little about sightseeing in the urban sense of the word. In fact, there is not too much to miss - the most attractive towns in the "Innergebirg" (literally "inside the mountain area", a term used for the region South of Hallein, the counties of Pinzgau, Pongau and Lungau) are Zell am See, Bad Gastein, Werfen and Radstadt. The latter one is a result of the Prince Archbishop′s shocking discovery that his little empire was "accessible like a village", as one famous 16th century phrase puts it. This proved to be a problem with the increasing thread of protestant uprisings and the Otoman (=Turkish) empire advancing towards Vienna and Styria. Following this discovery, several towns were heavily fortified, castles extended and churches equipped with dramatic wallwork. The city of Salzburg was among the last and got its dramatic bastions and town walls only during the 30 Years′ War - the scale of the bastions was so dramatic that the taxes had to be increased to a degree that a fair part of Salzburg′s population suffered in poverty under the reign of Prince Archbishop Paris Lodron. However, not a single casuality was to occur in Salzburg through the 30 Years′ War, whereas neighbouring Bavaria lost approximately one third of its population. Further from the capital, in Carinthia (which largely belonged to the Prince Archbishop back then) and the South of today′s Salzburg, the Turks were the main reason for increased fortifications. One fine example for this is Radstadt, which got impressive town walls. They are largely preserved and make a good "red line" to follow for an excursion to the town - it takes only about 20 minutes to walk the walls. Otherwise, Radstadt has few attractions to offer to the sightseeing-seeking folks. 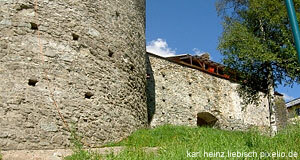 The town has one and a half museums, the half being a small historic exhibition in the Kapuzinerturm ("Capuchin Tower"). It concentrates on the strategic importance of Radstadt and shows some medieval and early modern armour. The other museum is the Heimatmuseum outside of the centre. It is housed in the Schloss Lerchen Castle, more a manor than a castle, though. This one deals more with the local folk culture. Beyond this, you are probably doing best by just walking around for a bit. Radstadt offers excellent connections to the surrounding mountains, which is great for hiking in the summer and skiing in the winter. The ski resort of Schladming is only a few minutes by car. Other places to go nearby would be the National Park Hohe Tauern, the Lungau area or the Eisriesenwelt Werfen, the ice caves north of Radstadt.